Katherine Kaus’s figure, based on an article she co-authored, will appear on the cover of the Sept. 9 Journal of Molecular Biology. The figure depicts the structure of a domain of the Vibrio vulnificus hemolysin that binds cell-surface glycans allowing the toxin to attack target cells. The structure was determined using a technique called X-ray crystallography. 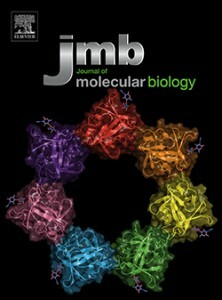 A figure created by Katherine Kaus, graduate student in the Molecular Biology and Biochemistry Department, was selected to run as the featured cover graphic in the Sept. 9 Journal of Molecular Biology. The graphic is related to her article, titled “Glycan Specificity of the Vibrio vulnificus Hemolysin Lectin Outlines Evolutionary History of Membrane Targeting by a Toxin Family,” which was published in the journal on July 29. It is co-authored by Rich Olson, assistant professor of molecular biology and biochemistry, and researchers at the University of Connecticut. The abstract appears online here. Vibrio vulnificus is an emerging human pathogen that causes severe food poisoning and opportunistic infections with a mortality rate exceeding 50 percent. The aquatic pathogen secretes a pore-forming toxin (PFT) called V. vulnificus hemolysin (VVH) which form transmembrane channels in cellular membranes. “Determining the mechanism for how PFTs bind membranes is important in understanding their role in disease and for developing possible ways to block their action,” Kaus explained in the paper’s abstract. Sequence analysis in light of the authors structural and functional data suggests that V. vulnificus hemolysin may represent an earlier step in the evolution of Vibrio PFTs.